After 24 years in Los Angeles as a costume designer and teaching artist, Nancy Konrardy relocated back to the Midwest to Roca, just south of Lincoln. From designer, collaborator, costume fabricator, milliner, mask maker, dyer-painter, makeup artist to scenic artist, Nancy brings a varied & vast range of experiences to the creation of her residencies. Nancy’s most recent work in Los Angeles included 4 years at The Skirball Jewish Cultural Center & Museum as an educator and Drop In Art Studio Coordinator. Nancy taught 8 years in grades K-8; created programs for home schoolers; and founded both a summer cultural arts day-camp for K-8 students and a non-profit arts education organization called Teaching Arts. Nancy began her teaching out of a desire to enhance classroom learning and inspire children’s personal experience through art and creativity. In all of her projects, Nancy uses and supports art standards while striving to make connections to core subjects such as math, science, history and writing. 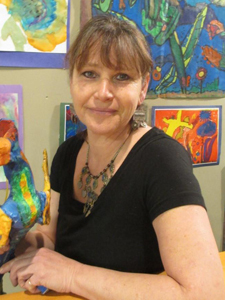 Nancy uses art as a vehicle for students to discover and expose the interconnectedness of all things, stimulating life-learning through creative thought and problem solving. Nancy has also been recognized (for costume design) with two Daytime Emmy awards and an NAACP Image award.